Mila Versteeg was at IILJ in the Spring of 2009. She is an associate professor at the University of Virginia Law School. Her research and teaching interests include comparative constitutional law, public international law and empirical legal studies. Most of her research deals with the origins, evolution and effectiveness of provisions in the world’s constitutions. 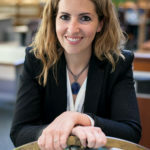 Her publications have, amongst others, appeared in the California Law Review, the New York University Law Review, the University of Chicago Law Review, the American Political Science Review, the American Journal of Political Science, the Journal of Legal Studies, the American Journal of International Law, and the Journal of Law, Economics and Organizations. A number of her works have been translated into Chinese, Portuguese and Turkish. Versteeg earned her B.A. in public administration and first law degree from Tilburg University in the Netherlands in 2006. She earned her LL.M. from Harvard Law School in 2007 and a D.Phil. in socio-legal studies in 2011 from Oxford University, where she was a Gregory Kulkes Scholar at Balliol College and recipient of an Arts and the Humanities Research Council Award. Prior to joining the Law School, Versteeg was an Olin Fellow and lecturer in law at the University of Chicago Law School. Versteeg previously worked at the U.N. Interregional Crime and Justice Research Institute in Turin and at the Southern Africa Litigation Centre in Johannesburg. While at UVA, Versteeg has been a visiting associate professor at the University of Chicago Law School (fall 2013) and Columbia Law School (spring 2016), and a visiting professor at the law schools of Hebrew University, the University of Hamburg (summer 2015) and Tel Aviv University (spring 2017).